Added /SaveAddressBooks command-line option for exporting the names of address books into a file. Added new quick filter combo-box: 'Show only items match the filter' and 'Hide items that match the filter'. Added 'Quick Filter' feature (View -> Use Quick Filter or Ctrl+Q). When it's turned on, you can type a string in the text-box added under the address-books combo-box and OutlookAddressBookView will instantly filter the address book table, showing only lines that contain the string you typed. Fixed bug: OutlookAddressBookView crashed when using the find option while the last item was selected. Fixed the export to csv file to enclose a field with quotes if it contains new line characters (CRLF). Added 'New OutlookAddressBookView Instance' under the File menu, for opening a new window of OutlookAddressBookView. Improved the memory allocation for address books with large amount of items. Added "Don't load Entry IDs" and "Don't load Exchange strings" options. You can use these options to reduce the memory footprint when loading very large address books. When OutlookAddressBookView fails to load the selected address book, error code is now displayed in the bottom status bar. Added /SaveDirect command-line option for using with the other save command-line options (/scomma, /stab, /sxml, and so on...), which allows you to export the address book records directly to a file, instead of accumulating all data in memory and then save them to file in the end. Added 'Exchange String' column (For address books of MS-Exchange only). Added 'Record Type' column (Mail User, Distribution List, Private Distribution List, or Remote User). Added 'Copy As Simple CSV - For NK2Edit' option (F8), which allows you to easily copy the selected records and then paste them into the NK2Edit tool. 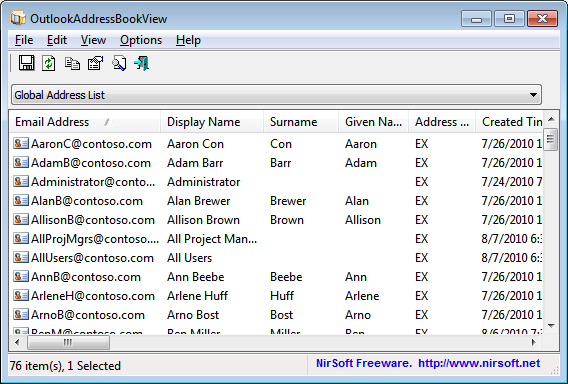 The name of the selected address book is now displayed in the window title. Fix the 'Department Name' column header, which was mistakenly changed to 'OutlookAttachView Config File' in Version 1.70 update. Added 'Copy Names Only' option, which copies the display names of all selected records to the clipboard, each name in a separated line. /SaveAddressBooks <Filename> Save the names of all address books into a file. OutlookAddressBookView is also available in other languages. In order to change the language of OutlookAddressBookView, download the appropriate language zip file, extract the 'outlookaddressbookview_lng.ini', and put it in the same folder that you Installed OutlookAddressBookView utility.